t*rexes and tiaras: Friday Favourites 086.. This week there hasn't been a lot of time for window shopping, so it was fairly easy to narrow my weekly wishlist down to the two products which I have noticed and have taken my fancy. 001: I don't think I'll be buying this, as I really can not justify purchasing ANOTHER coat. Regardless of the fact that it's a beautiful colour, and I love the zip detail and the reasonable price tag, I think that the door I hang my coats on would probably fall right off it's hinges if I tried to add another. I once owned a coat stand, but that died fairly quickly once I'd tried to hang about half of my coat collection. When I move, I plan to have a whole wall of coat hooks so that I can make my collection something of a display. 002: Eclectic Eccentricity are one of those brands who always come up with something which appeals to me. 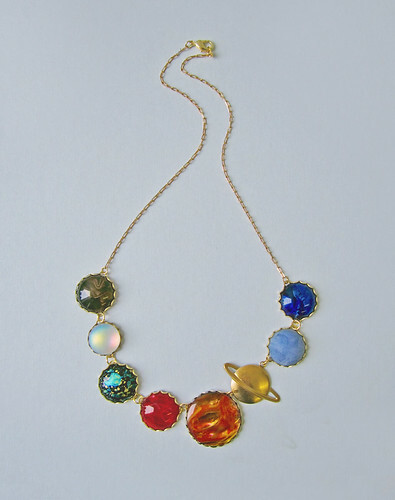 Every single season, without fail, they bring out some fabulous pieces and this solar system necklace is no exception.I feel a little sorry for Pluto for being left out but there is a Pluto necklace as well. Has anything caught your eye this week? I don't think I'm going to get much time for shopping this weekend, what with an allotment work day, the poker themed birthday party and a trip to Cadbury World to fit in to this weekend. I also need to make some more progress on my Mad Men dress for Julia's challenge - eep! I'm trying hard not to shop as much but it's proving so difficult! oooh the Mad Men challenge sounds good. I'm a Betty fan, Joan dresses are a bit too fitted for my liking. Can't wait to see what you come up with. I've picked Betty, of course. Even though I'd rather be like Joan as Betty is a total brat, her wardrobe is just so much better. It's going to be tough not to buy it! That coat is sooo beautiful. 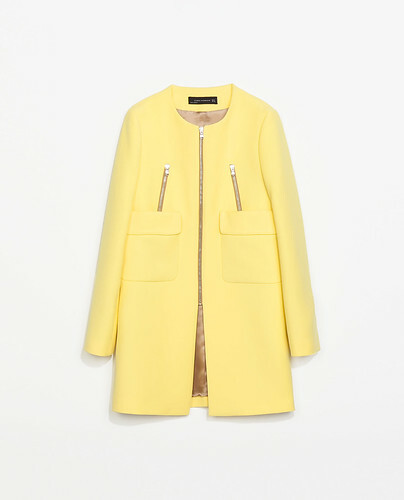 I'm a sucker for yellow and that coat looks perfect in every way. Have you thought about displaying your coats on some ornamental ladders? They don't usually take up too much space. I used to display coats on the ones at work and they can take quite a bit of weight. Rolling rails are great too. Sadly my coats are just squashed in the hallway cupboard. Ooh, that's a good idea. I was thinking of a sort of display wall in the hallway but my current place doesn't really have any spare wallspace.